The United Nations General Assembly has passed a resolution to create new legal rules to stop financial speculators like vulture funds from undermining debt restructurings. The motion, passed by 124 votes to 11, has decided that the UN will create “a multilateral legal framework for the sovereign debt restructuring processes”. At present, there are no rules regarding how to restructure the debts of countries when they can no longer be paid, leading to prolonged debt crises and expensive bank bailouts, and an open door for vulture funds extortion of countries in debt crisis. The creation of such rules could, amongst other things, solve the current impasse over Argentina’s debt, where two vulture funds NML Capital and Aurelius Capital Management are seeking a gigantic profit after speculating on the South American country’s debt, have refused to accept a debt restructuring agreed by 93% of other creditors, and have had their claim backed by a US court, preventing Argentina from paying their debts. “The resolution represents an important step forward in fixing the broken global debt system and developing countries have shown fantastic leadership in pushing it through despite the opposition of the UK and a handful of other rich country governments. The UK and US voted against the motion, following a joint decision between the Chancellor George Osborne and his deputy, the Chief Secretary to the Treasury, Danny Alexander. 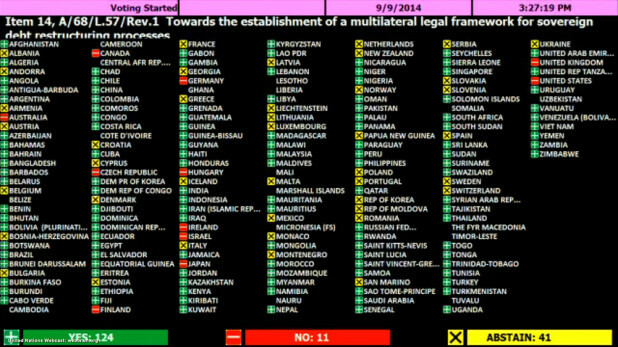 Almost all developing countries voted in favour, including Brazil, China and India. The majority of European countries, including France, Greece, Spain and Italy abstained, indicating a willingness to take part in further negotiations. Despite this, the UK government has continued to oppose new multilateral rules through the United Nations – the only international organisation where the votes of countries carry equal weight – for dealing with debt restructurings. Instead, the UK government wants all discussions on debt to take place in the International Monetary Fund, where the UK has a disproportionate voice, and most developing countries have little say. The IMF is also itself a large lender, so there is a clear conflict of interest for the IMF to both be a creditor and arbitrator over government debts. 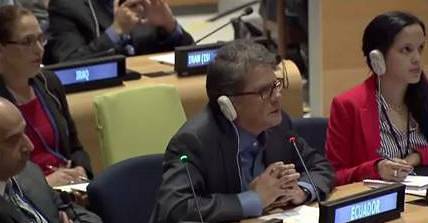 Now the resolution has passed, UN negotiations will commence on the modalities and institutional arrangements of the legal framework. 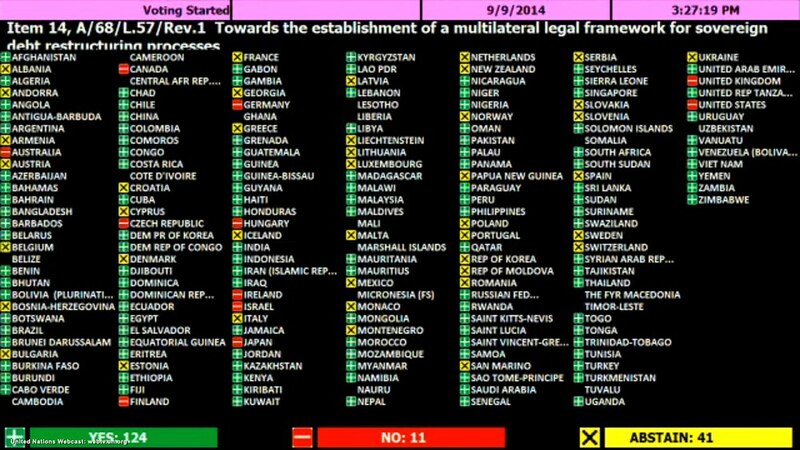 The eleven countries which voted against were Australia, Canada, the Czech Republic, Finland, Germany, Hungary, Ireland, Israel, Japan, the US and UK.